This solitaire or two players game offers a series of “what ifs”, based on the historical situation following the Italian Armistice, signed 8th of September 1943. Starting from the historical position of the Italian and German divisions, one player, as the Italian, must try to save Rome from falling in German hands before the arrival of the American reinforcements through the air. 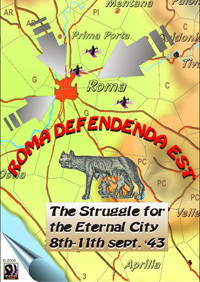 But this game can also be played with a German opponent, or from the German perspective, with a single player try to reach the Eternal City before the American air transported units. Paul Kwon 7 8 8 The spaces around Central Rome were too tiny. I think a special extra map is needed.